The Common Energy UBC delegation at the SFU Sustainable Campuses Conference has had an incredibly inspirational, educational, and fun past four days! We’d like to thank the conference organizers for establishing an awesome balance between learning, networking, and having lots of fun (we loved the dodgeball “personal sustainability” break). Common Energy was lucky enough to have 12 current members and 2 alumni at the conference. 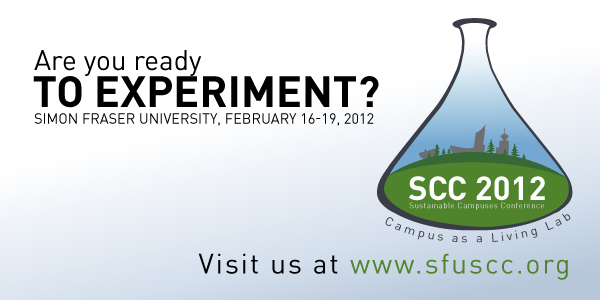 The annual Sustainable Campuses Conference is run in collaboration between the Sierra Youth Coalition, the goBEYOND Campus Climate Network, and the host school’s organization which, this year, was Sustainable SFU. Our members attended workshops covering topics which included: Personal Sustainability, Community Mapping, Energy in Western Canada, Building Effective Teams, and Reconnecting with Nature. For our newer members this was a fabulous introduction to the campus sustainability community fostered by goBEYOND as well as an important time for skills building and networking. For our more long-time members, this was a great chance to reconnect with old friends and colleagues from other campuses. We were also able to share our experiences through two workshops. The first was by Angela Willock, Rosalind Sadowski, and Quinn Runkle entitled “Student Engagement in Sustainability” which introduced the participants to the concepts in Angela, Rosalind, and Quinn’s research on the topic as well as taking them through the thought process of using a framework to evaluate the “level” of engagement on one’s campus. Two frameworks were presented, one which addresses student engagement from an institutional perspective and the other from a personal perspective. The second workshop was by Kyuwon Kim and Quinn Runkle which used Common Energy as a case study for building a sustainable organizational structure. Common Energy has been consistently growing over the past five years and so it was an amazing opportunity to share its model with other students from similar campus organizations. We even got to connect with our partners at Common Energy uVic! We also want to thank the UBC Student Environment Centre for generously funding a part or all of each participants’ fees. We really appreciate this support.